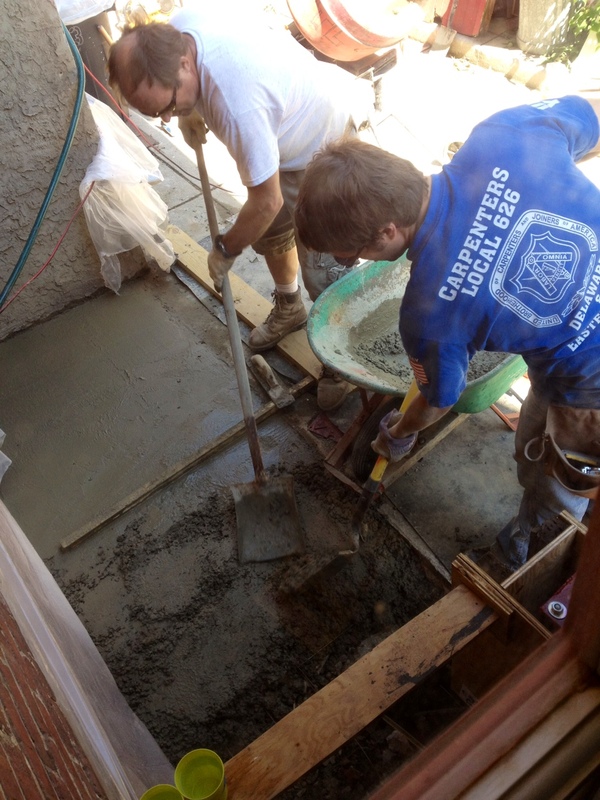 We got an early start today and it finally happened … We poured concrete! 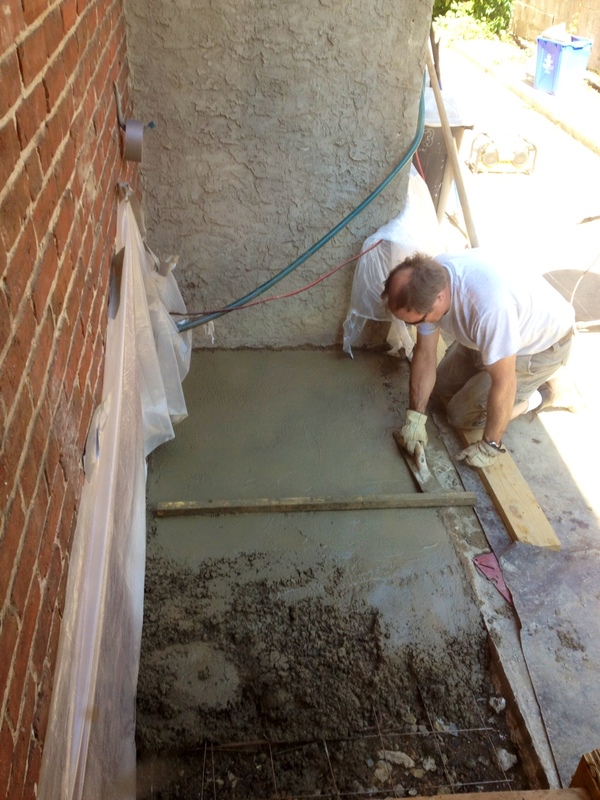 You have to get the concrete to an oatmeal like consistency and pour it slightly above the form. And we did this over and over again working our way across the porch. Then finally it was time to start finishing. (But don’t wait too long to start this step.) 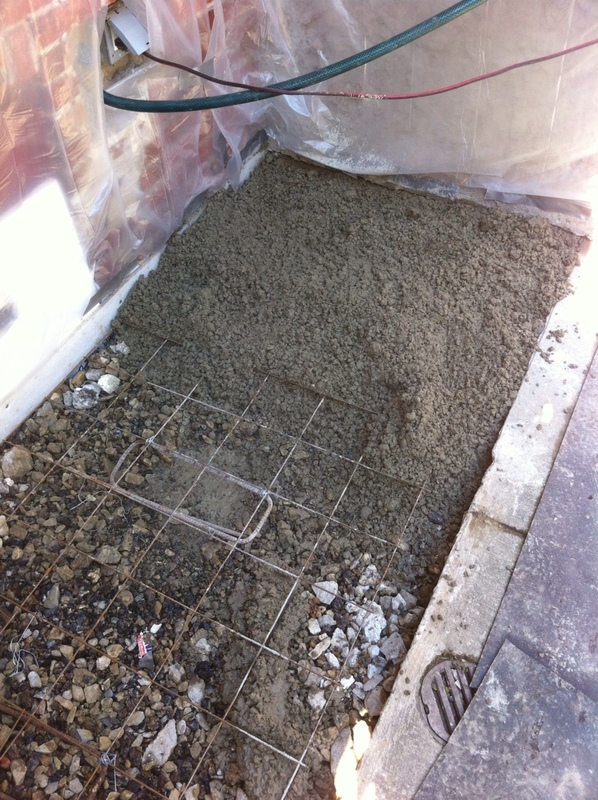 As you work the surface with a float the rocks sink and the cement paste rises to the surface. 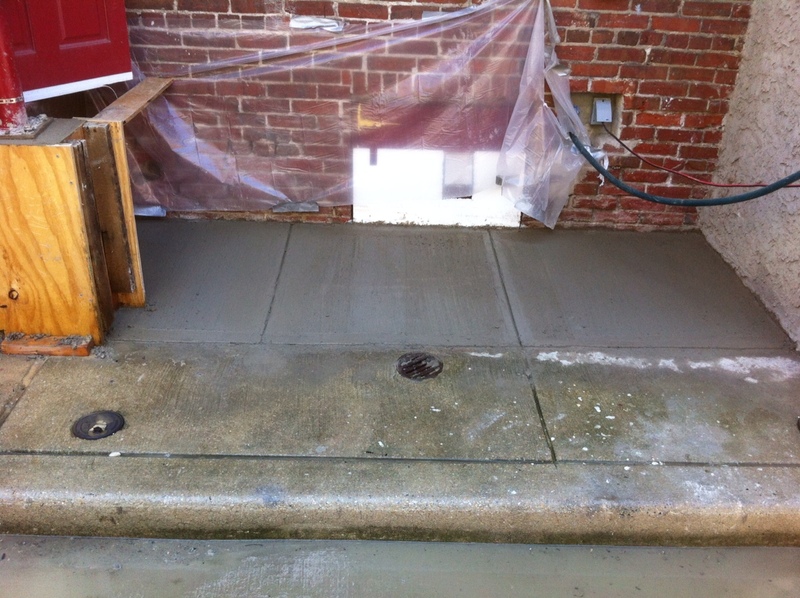 This is the critical time to get slab straight, fill in low spots, and get a nice surface. And more finishing! 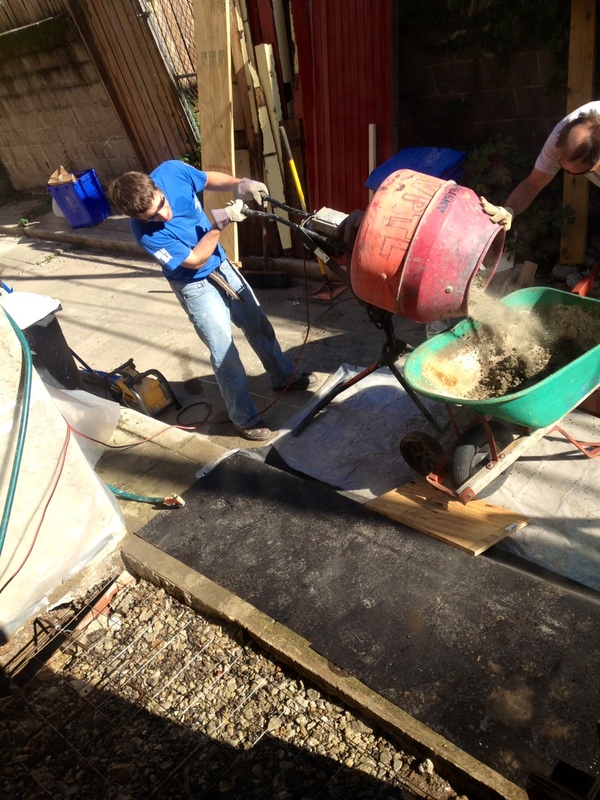 Once we had all the material down and floated to a flat surface, we gave it a” broom swept” finish (with a broom of course). 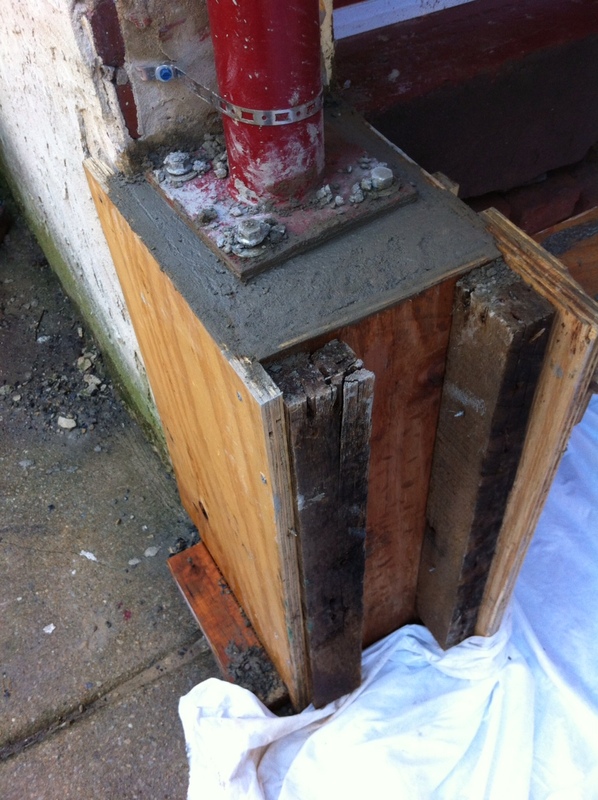 Then we cut in the control joints and the nice perimeter edges. And finally all done and time for a late lunch! I think it didn’t turn out too bad for our first time. 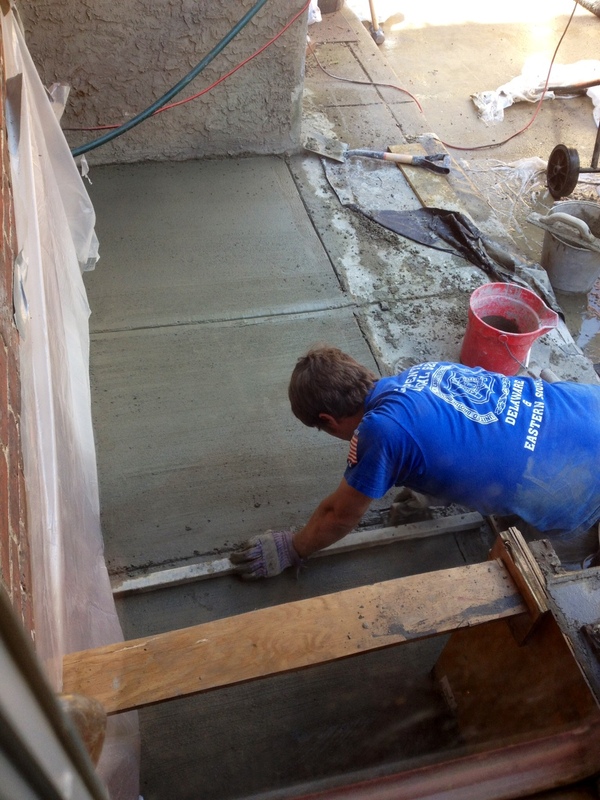 We covered the fresh concrete, after signing it of course, with a special composite fabric to help keep it moist to dry slowly for better strength and less shrinking and cracking. 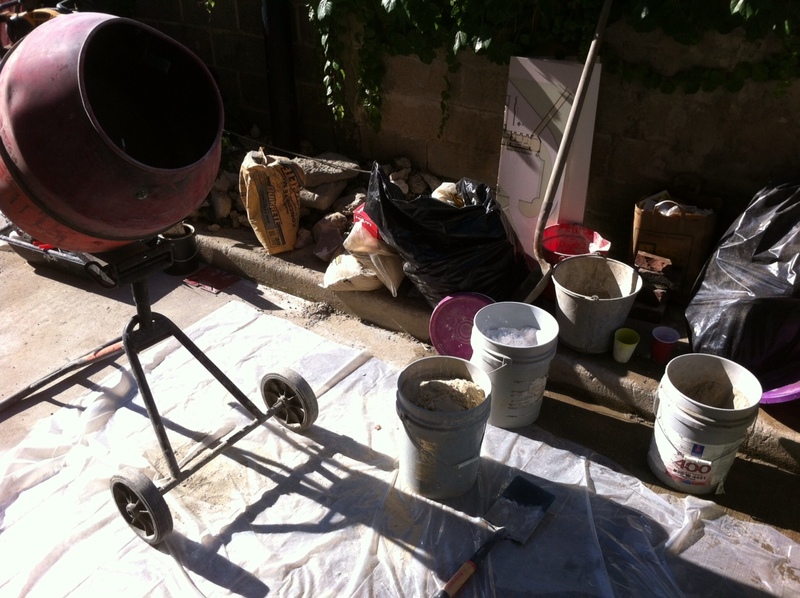 So after lunch it was time for masonry project two … Stucco! First look at the shadow on the mixer compared to this morning’s picture. 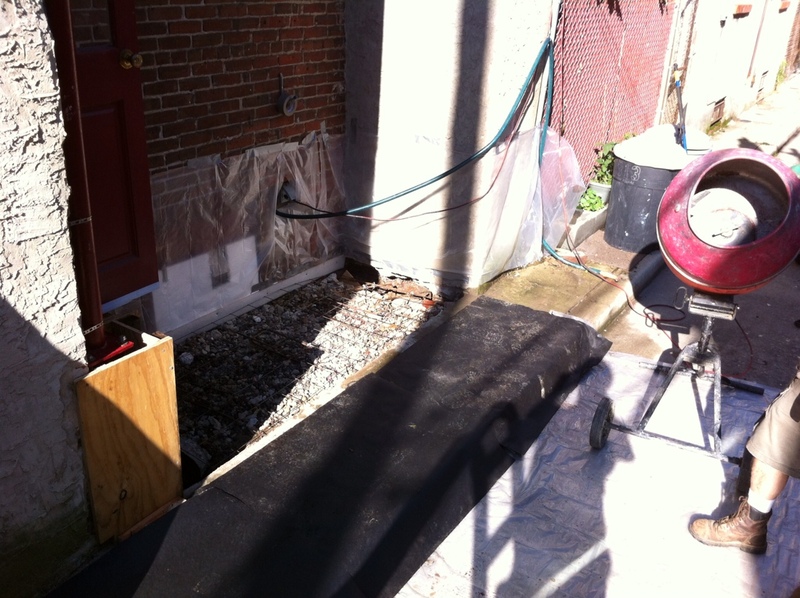 On this long day we have seen the sun hitting us from both ends of the alley… what a long day. 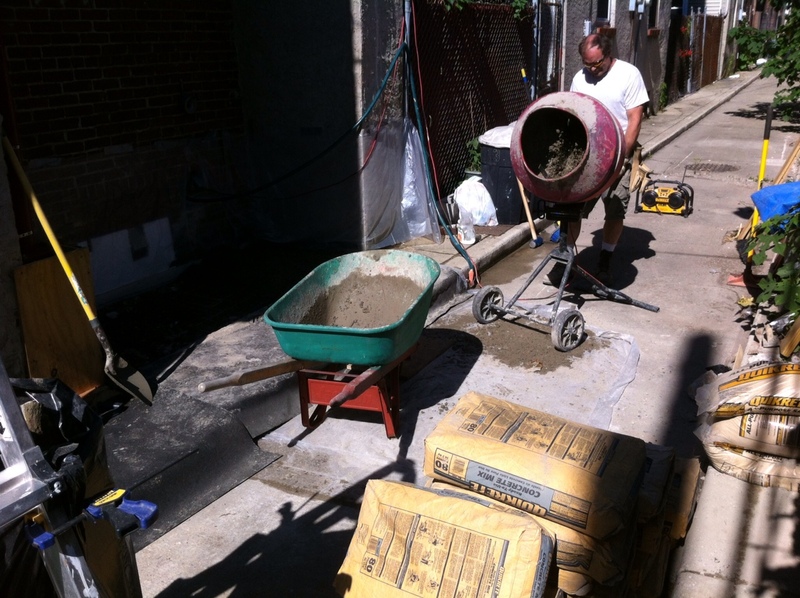 Like our other masonry projects, we mixed our own stucco from cement, lime, and sand. 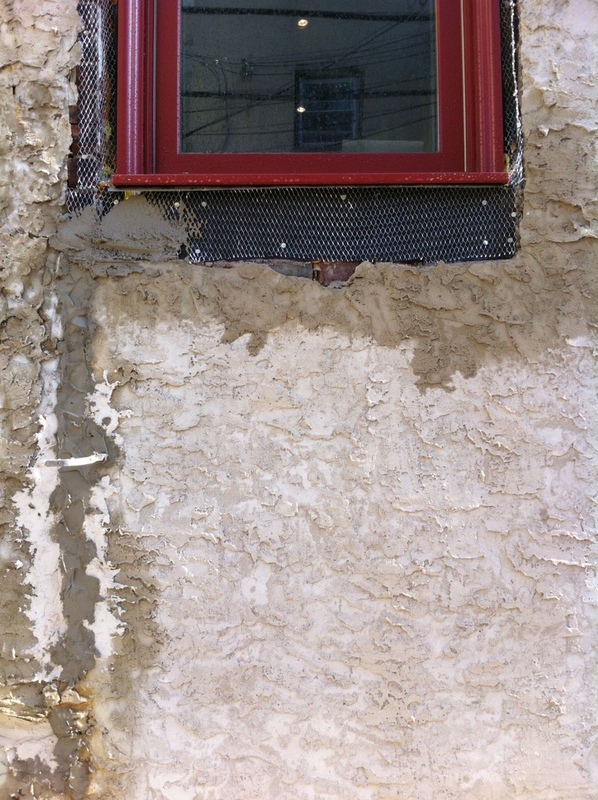 We filled in around the new windows with tar paper, flashed under the sills, and installed expanded wire mesh for strength. 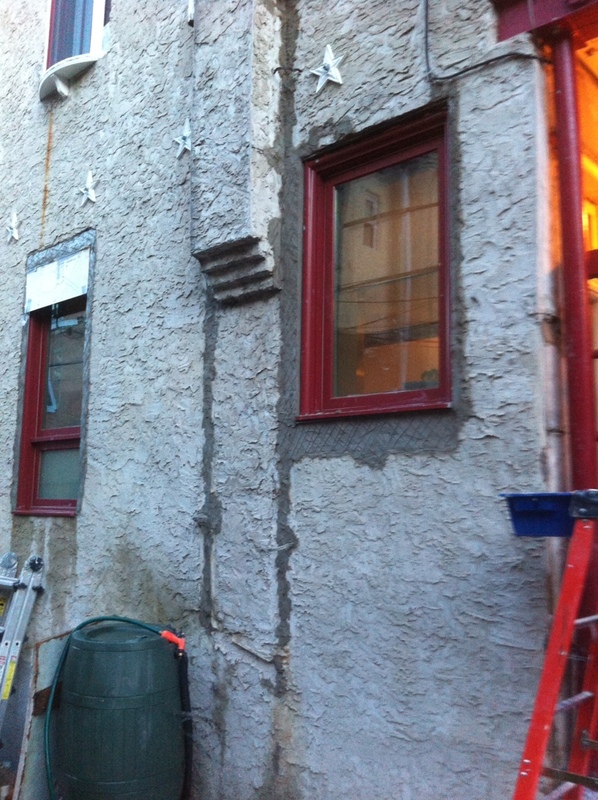 Then we stucco’ed. 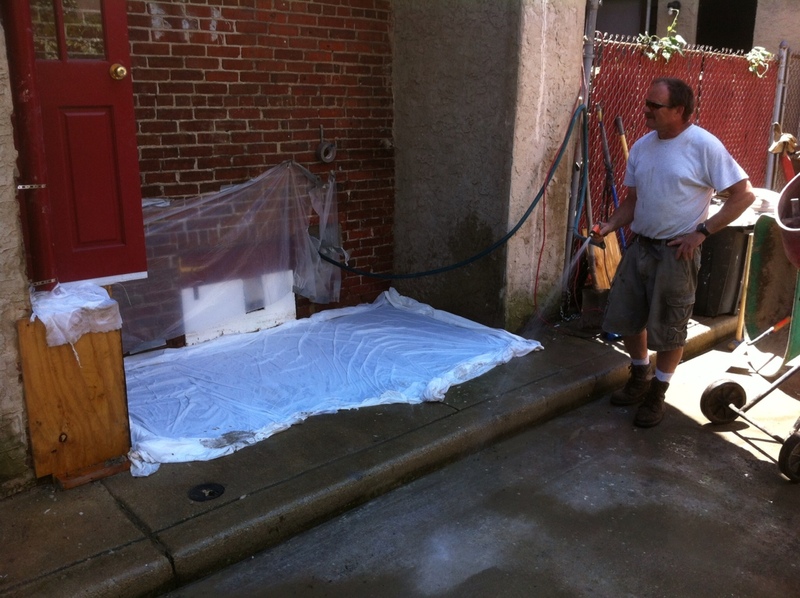 This wa the first or scratch coat… more to come. Both Kitchen windows got patched and the areas behind our gutter which had previously been missed. The reason we are doing this now is that we have the mixer from the tool library and the door track will go below the one window. We will eventually also have to patch around the upper windows.